On this page you will find various resources to assist rural and remote allied health professionals. If you are the author of any relevant resources and would like to have your work published on this page, please contact the SARRAH office. The Extra Mile is designed to help make your transition to rural practice as smooth as possible. As with all journeys worth taking, careful preparation will be crucial. Written with wit and wisdom, this book covers everything you need to know to prepare you for the challenges that lie ahead. 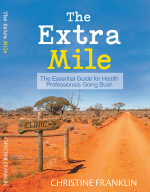 From Christine Franklin, author of The Extra Mile, "If you pick up my book I hope you will discover the very essence of what I love so much about rural health - that the breadth and depth of professional and personal experience that this area of health can offer is unlimited. As much as it will challenge you, rural health has the potential to take you places you may never have imagined possible". To find out more about this resource, please visit the book website by clicking here. This eBook has been developed as a powerful learning tool and is based on the 2016 Review of Illicit Drug Use Among Aboriginal and Torres Strait Islander People. It is the second eBook part of a suite of digital tools and new platforms to deliver knowledge and information to the sector. The eBook is a tactile, sensory tool which provides multiple ways of utilising the latest technology to assist learning about this important topic. The eBook has been created for Apple devices such as iPads, iPhones, laptop and desktop computers. It is free to download from iTunes and via the AODKC. Please click here to download. To further your knowledge about this important issue, please access the report and animated infographic of the eBook here. Community Resourcing has been funded to provide an online collaborative space for initially 1000 Community Care providers but with an eye on the world. This funding follows on from the success of our State-wide Smart Assistive Technology Sessions in 2014. As a result of the success Community Resourcing has been engaged once again by the Queensland Government Department of Communities, Child Safety and Disability Services to establish The Community Care Smart Assistive Technology Collaborative –this exciting and innovation online platform. This platform is available to Community Care providers and provides a space to collaborate, learn and access resources and expertise. This platform contains local, state, national and international linkages and resources. The focus on local, national and international community care practices and experiences with incorporating Smart Assistive Technology in service provision will ensure participants are able to access leading edge and contemporary information. Health professionals will have access to new clinical practice guidelines to help them identify and treat mental health problems following National Health and Medical Research Council’s approval of guidelines developed by beyondblue: the national depression initiative. In the previous government, then Minister for Mental Health and Ageing Mark Butler welcomed the release of the two clinical practice guidelines addressing depression and related issues, and said that the Gillard Government had a strong commitment to making sure that people who are dealing with mental health issues receive the best possible care and treatment. “These Guidelines will assist health professionals across Australia to identify and respond to depression and mental health risks for young people and mothers. “One guideline will provide guidance in the effective treatment of depression amongst the traditionally hard to target group of adolescents and young adults aged 13 to 24 years. The second will assist primary and maternity care health professionals provide care to those in the perinatal (around birth) period to improve quality of life for mothers and their babies. The beyondblue Clinical Practice Guideline: Depression in Adolescents and Young Adults and Clinical Practice Guidelines for depression and related disorders – anxiety, bipolar disorder and puerperal psychosis – in the perinatal period were partly funded by the Australian Government. 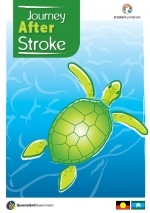 Easy to read, practical information to encourage behaviour change to reduce the risk of stroke. Developed by the Rural Stroke Outreach Service, The Townsville Hospital, after extensive consultation with Indigenous Liaison Officers and Health Workers, Aboriginal and Torres Strait Islander stroke survivors and their families. 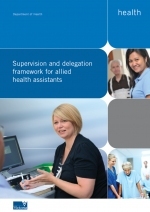 In 2010-11, the Department of Health (DoH) engaged Healthcare Management Advisors to develop the 'Supervision and delegation framework for allied health assistants' (the framework). The framework has been developed through research and broad stakeholder consultation and provides information and guidance to enhance the utilisation and development of the allied health assistant role (AHA) across health and community services throughout Victoria. The framework incorporates the breadth of views and opinions of the varying stakeholders who took part in the consultation process from a variety of health care settings in rural and metropolitan Victoria. The framework is available on the Vic Health Workforce website by clicking here. DoH has also undertaken a number of activities to promote the uptake of the framework and is currently in the process of developing an additional web page which will provide AHA related information and resources, including the framework.